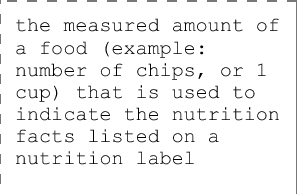 Use these flash cards to learn the various components of nutritional information on your food labels. 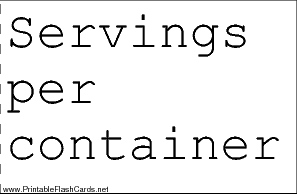 Servings per container the number of servings of a food that a container holds. 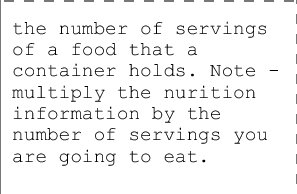 Note - multiply the nurition information by the number of servings you are going to eat. saturated fat are generally solid at room temperature, are the least healthy and tend to increase the level of cholesterol in your blood. Foods that contain saturated fat include butter, cheese, some margarines, shortening, tropical oils such as coconut and palm oil and the fats in meat and poultry skin, so you should try to limit your consumption of those oils and foods. unsaturated fats Reduce your blood cholestero and are the GOOD fats. 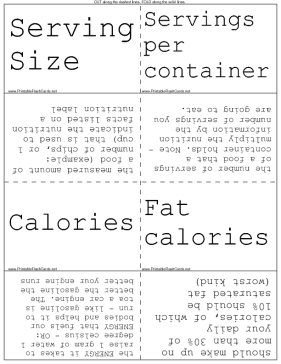 Two types Mono- and Poly unsaturated fats. Poly unsaturated fats come from plants and fish.- but are more likely to form "free radicals" and lead to tissue damage. Good sources include most other vegetable oils (corn) and high fat fish, such as salmon and tuna. Should make up only 10% of total calorie intake. 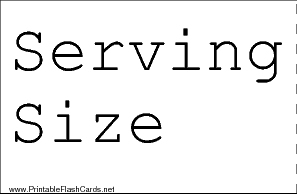 partially Hydrogenated Vegetable Oils in margarines and shortenings, contain "UNsaturated fats" called "TRANS FATTY ACIDS"
Trans Fatty Acids type of fats contained in margarines and shortenings. containe UN saturated fats, and may raise blood cholesterol levels, but not as much as saturated fats. Cholesterol a fatty substance, also called a lipid, that's produced by the liver. also found in foods high in saturated fat (fatty meats, egg yolks, shellfish, and whole-milk dairy products) A vital part of cell structure and functioning but high levels of cholesterol in your blood may lead to the slow buildup of plaque in the arteries - a disease called atherosclerosis. simple carbohydrates found in fruits and dairy products are more easily digested by the body. They are also often found in processed, refined foods such as white sugar, pastas, and white bread. complex carbohydrates take longer for the body to digest, are most commonly found in vegetables (cellulose), whole grain breads and pasta, brown rice, and legumes. Foods with unrefined grains, such as brown rice, retain complex carbs, unlike refined grains, such as white rice. protein protein in the foods we eat is digested into amino acids that are later used to replace used amino acids (cell building blocks) in our bodies.20 different amino acids that join together to make all types of protein. Some of these amino acids can't be made by our bodies, so these are known as essential amino acids. It's essential that our diet provide these.